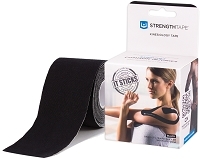 This may be caused by overuse, muscle stress, other soft tissue problems such as MCL or ACL tears or stress. Fold a full strip of tape in half and cut rounded corners on the folded end of the tape. 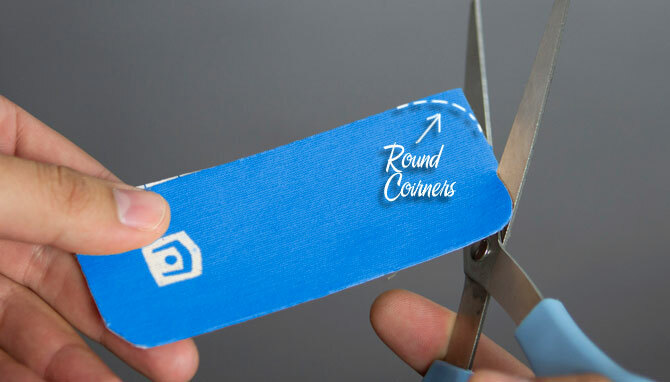 Rounding the corners will prevent the corners of the tape from getting caught or peeling off too early. Bend you knee to a 90 degree angle. Using the first half of the first strip, Tear the backing paper in half and stretch the tape to help remove the paper. Try not to touch the adhesive. Apply the piece below the knee cap with 75% stretch. 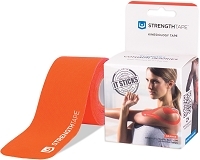 Apply the ends of the tape with absolutely no stretch. Take the second half of the first strip and apply it exactly the same way over the first half with 75% stretch. Again, anchor the ends of the tape with zero stretch. Next take another full strip of StrengthTape and measure it around kneecap. Tear the “Champion” end of the tape and anchor it to the thigh above the knee. Remove the backing paper and follow the edge of the kneecap with 25% stretch. When you are even with the bottom of the kneecap apply 50% stretch while crossing under the knee. Finish off with zero stretch at the end. Now take the final strip of tape and mirror what you did with the 2nd strip. Tear the “Champion” end of the tape and anchor it to the thigh above the knee. Line the anchor up with the first piece.